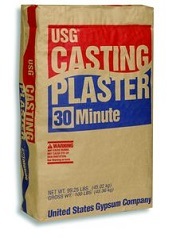 USG Moulding/Casting Plaster-30 Min. | Salmon Bay Sand & Gravel Co.
Base performance, interior use plasters for general casting and binding applications. Contain no additives for special physical property enhancements such as paint absorption and chip-resistance.General purpose plaster where expansion, control, hardness, and strength are not of major importance. Used for Moulding, Casting, Statuary and for Ornamental Plastering.